This post is sponsored by Lake Effect Co. Lakes are a KEY feature to the area in which we live called, “Lake Country”. It’s also part of our name LAKE Country Family Fun. Lake Country typically covers all of Waukesha County. Lakes span from southern Waukesha county by Muskego to northern Waukesha County in Colgate. Lakes are a BIG deal around here. We enjoy them year round. That’s why we’ve decided to put together a guide to the Lakes of Lake Country. Read on below! We’ve added 5 lakes to the guide in 2018!!! Let us know which one we should cover next. Also, when you are on any Lake Country Lake please tag us at #LOVELCFF. This is NOT the complete list of lakes. There are technically over 140 lakes – WOW! 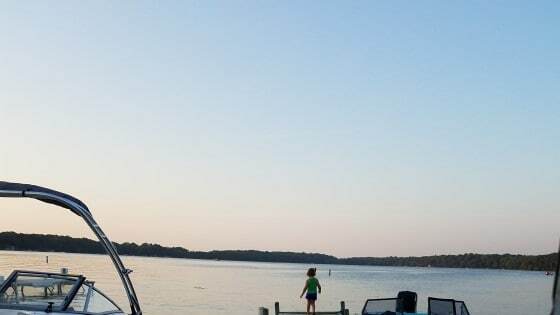 The Wisconsin Department of Natural Resources (DNR) has provided Lake Country Family Fun access to their excel document of the listing of all of the lakes in Waukesha County. You can access it by clicking here. Note: Data may be outdated, especially the boat launch/park columns. Thank you WI DNR! State/County Park Fees Apply at locations/beaches/lakes/launches. Where there are boat launches mentioned, fees usually apply. Now, let’s get a little crazy here! This summer, when you are on ANY Lake Country area lake, post a picture to Instagram with the hashtag #lovelcff and tag @Lakecountryfamilyfun as well. Be sure to make sure your IG profile is public so we can find you! You can check them out in the Smiley Barn in Delafield where they have been serving Lake Country for over 35 years! Boy, do we love our lakes! All of these lakes are over 1,000 acres, which is is just huge. There are four. Check them out below. Pewaukee is the biggest lake in Lake Country coming in around 2,493 acres. There are two public boat ramps and carry-on access. Free Public Beach – only free public beach in Waukesha County. Parking info. Read our Beach Guide here. Due to it’s size and public access, it is also Lake Country’s Largest and Busiest Lake. There are inland sailing races often. National sailing events take place annually and are often hosted by the Pewaukee Yacht Club located on the southern shore of the lake. Multiple lakefront restaurants including: Michaels House of Prime, Ristorante Lago, The Sports Dock, 5 O’Clock Club, Artisan 179, Doc’s Dry Dock, Edgewater Pewaukee, Seesters, Curly’s, Park Avenue Pizza, Butler Inn, Kim’s Lakeside. Pewaukee Ice is in the Pavilion by the Beach! They are open Monday – Sunday 10:00 am to 7:00 pm. This lake comes in at a whopping 2,260 acres. 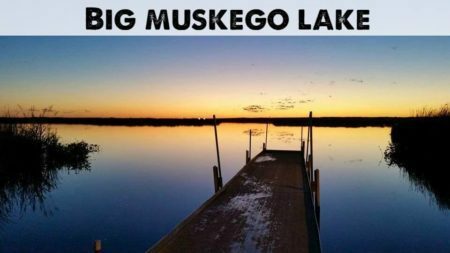 Big Muskego Lake is a shallow lake with a max depth of about 8 feet and is great for fishing, kayaking, hiking around and more. 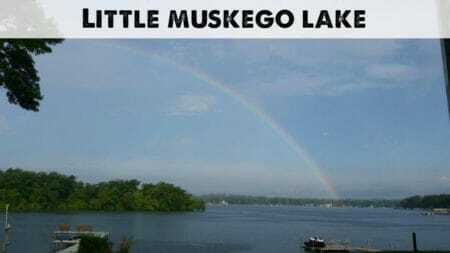 Most of Big Muskego Lake is less than four feet deep. There are multiple boat launch locations. Big Muskego Park provides boat launching and lake access on the northern shore of Big Muskego Lake. More Lake information from the city website. Enjoy the lakefront dining at AJ’s Bar & Grill. If you are looking for a sandy beach option in Muskego, Idle Isle is a park that offers a swimming beach and it is on Little Muskego Lake. Read our Beach Guide here. This lake is 1,187 acres and goes on both sides of Hwy P in Okauchee. Maximum depth of 115 feet. Public access and boat ramp. Okauchee Lake is fed by and drains to the Oconomowoc River. 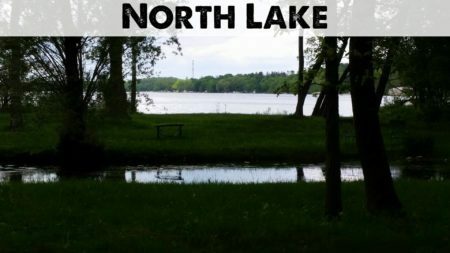 It is the third in a chain of lakes on the river with Freiss Lake and North Lake upstream and Oconomowoc Lake, Fowler Lake and Lac La Belle located downstream. One of the busiest lakes with restaurants and yacht clubs, and sail boat races. Many waterfront dining options including: Golden Mast, Foolery’s, and KickSwitch. 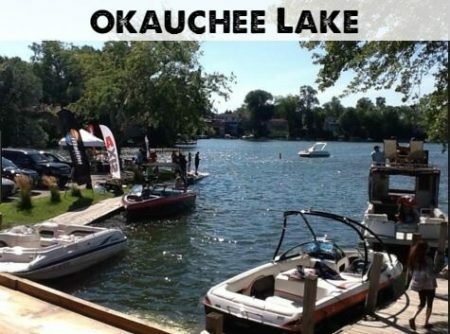 Great lake to tie up at party, relax or do some serious water sports or fishing! Note: There is not a public beach area. Check out more about Foolery’s and awesome date ideas in our Summer Date Guide! Lake is 1,117 acres and sits next to Fowler Lake in Oconomowoc. The max depth is 45 feet. Public boat ramps for fishing, boating and motorized water sports. More information on public boat launch here. Lac La Belle has 4 beaches! Read our Beach Guide here. Park Street Beach – Park Street Swimming Access is located on the southern shore of Lac Labelle at the end of Park Street. There is limited street parking available. Woodland Lane is located on the southern shore of Lac Labelle at the end of Woodland Lane. There is limited street parking available. *Cost is $2.50 per resident and $5.00 for non resident. Season bands available. Kids under 6 free with paid adult. We’ve considered “medium” as lakes between 400 – 1,000 acres in size. Below we cover the five “medium” sized lakes. This lake is approximately 958 acres and has a maximum depth of 90 feet. 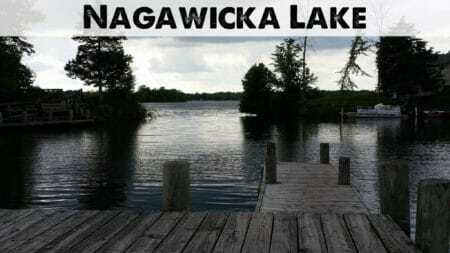 Nagawicka means, “there is sand”. The Bark River flows into the lake and there are sandbars on the western shoreline. The public can access the lake via a public launch off of Hwy 83. More details, including fees, can be found here. It is a great fishing lake. The lake is also great for motor sports, boating and any other type of water activity. Naga-Waukee Park is a county park, so Waukesha County Park Fees apply to visitors. Naga-Waukee Park offers 130 feet of sandy beach, a beach house with restrooms, and a great concession stand. The beach has lifeguards and opens June 3, 2017 with hours of 11 to 7. Beach rules here. Read our Beach Guide here. The Seven Seas restaurant is the lone public establishment on the lake and has pubic access via land or water. While not “on” the lake, Fishbones is right across from the lake with great lake views. More date ideas in Lake Country here. Both Seven Seas and Fishbones are also in our brunch guide! Pine lake is a lake of about 703 acres with upscale residences and mansions. The island is private and owned by Pine Lake Association. It is a beautiful, clear lake with a wooded shoreline. There is a new, beautiful public boat launch called the Village of Chenequa Pine Lake Boat Launch. Information including fees can be found here. You have view the 24/7 lake webcam thanks to City of Chenequa. Little Muskego Lake is a 470 acre lake located in Waukesha County. It has a maximum depth of 65 feet. It is north of Big Muskego Lake. There are multiple public boat launches. Information can be found here. Little Muskego lake has park/beach areas including Idle Isle Park and Muskego Park. Read our Beach Guide here. The Muskego Recreation Program holds water-related classes and recreational activities on the lake. See events at Idle Isle Park including the Muskego Waterbug Ski Shows that run all summer. Oconomowoc Lake is a 818 acre lake located in Waukesha County. It has a maximum depth of 60 feet. Oconomowoc Lake is a village located just outside the City of Oconomowoc, the village includes the residential area encircling Oconomowoc Lake. Around the turn of the 20th century, the area become known as a summer retreat for wealthy residents of Milwaukee and Chicago. It is a private lake with the Oconomowoc Lake Club located there as well. North Lake is about 437 acres with a max depth of 78. It is located due north of Pine lake. The lake sits between the Village of Chenequa and the Township of Merton. It is a quieter lake, with upscale residences and older cottages. There is no public boat launches/access. The four inlets are Big and Little Oconomowoc Rivers, Mason Creek and an inlet from Cornell Lake. The one outlet is the Oconomowoc River to Okauchee Lake. In this section we’ve listed some of our favorite lakes that are under 400 acres. Maybe they are a the hidden gem for kayaking, swimming, fishing or something else and we just can’t bear for you to miss out! Read on! Beaver lake is a little over 300 square feet with a max depth of 46 feet and average depth of 16. It is a very private lake with a wooded shoreline. Non-residents can access the lake for carry-in access only (canoes and kayaks) off a public launch on Hwy 83. One notable feature of the launch is the kayak ramp that helps people more when carrying their carry-ons from the parking to the water and back up. You can find more information on Beaver Lake and activities here. North Lake, Town of Merton and Chenequa surround Beaver lake. The water is very clear and the lake has a beautiful teal hue. Good fishing for Pike, Bluegill, Bass and Crappie. Golden Lake is a 252 acre lake in the town of Summit. The max depth is 44 feet. Visitors can access the lake via a public boat landing at 39627 Sunset Dr, Oconomowoc, WI 53066. Enjoy dining across from the lake at the Golden Lake Pub. There is a beach on Golden Lake near Hwy 18 and Golden Lake Road (across from Sandy Miller’s Beach shack). The beach is $10 per carload or $5 per person walk or bike in. Is is a swim at your own risk beach. There is a no wake ordinance from noon to 4pm on Saturdays, Sundays and Holidays. 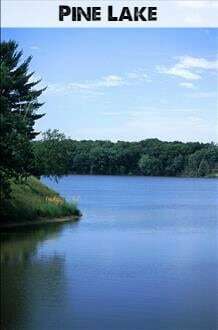 Fowler Lake is just under 100 acres and located in the heart of Oconomowoc. It has a max depth of 50 feet. There is one public boat landing located behind City Hall and is accessible from St. Paul Street. Limited on-site trailer parking is also available. More info on the launches here. Fish include Panfish, Largemouth Bass, Northern Pike and Walleye. The lake’s water clarity is very clear, but weedy. There is a boardwalk along the back side of Wisconsin Avenue, which is currently under construction. The lake is easily accessible from downtown shops and restaurants. There is a 2 mile walk around Fowler Lake, which is a Lake Country Family Fun family favorite thing to do. Fowler Park is on the east shore and has a playground and hosts many events throughout the year. Lake Five is a 104 acre lake located in Colgate (northern Waukesha County). It has a maximum depth of 23 feet. The lake’s water is moderately clear. There is a boat rental place on the lake called, “Lake Five Boat Rentals” that has been around over 50 years. Call them at (262)337-2824. Enjoy an adult beverage, brunch or treat at Joe Mama’s Bar & Grill, just up the road. They have a great patio, volleyball courts and great food! They even won 1st place in our Best Local Fish Fry this year. The lake has some ordinances you can read more about here. The Genesee Lakes all reside in the town of Summit. The main difference is the upper is smaller with no gas engines/motors; the middle is best for fishing. Upper Genesee Lake is a 32 acre lake located in Waukesha County. It has a maximum depth of 27 feet. Visitors have access to the lake from a carry-in public 5-spot site of Hwy 67. Fish include Panfish, Largemouth Bass and Northern Pike. The lake’s water is moderately clear. Middle Genesee Lake is a 98 acre lake located in Waukesha County. It has a maximum depth of 40 feet. Visitors have access to the lake from a public boat landing. Fish include Panfish, Largemouth Bass and Northern Pike. The lake’s water is moderately clear. Lower Genesee Lake is a 63 acre lake located in Waukesha County. It has a maximum depth of 45 feet. Fish include Panfish, Largemouth Bass and Northern Pike. The lake’s water is moderately clear. 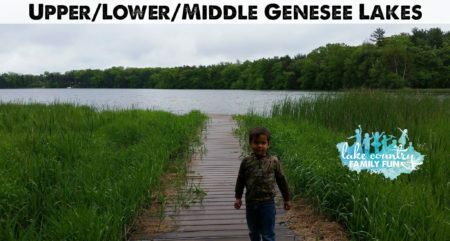 The boat launch site for Lower and Middle Genesee is located between the lakes and share a lot. These lakes are separated by a narrow gravel road called, Genesee Lake Road. Lower Nemahbin Lake (south of I-94) is a 239 acre lake located in Waukesha County. It has a maximum depth of 36 feet. Visitors have access to the lake from a public boat landing. Fish include Panfish, Largemouth Bass, Smallmouth Bass, Northern Pike and Walleye. The lake’s water is moderately clear. The Lower Nemahbin hosts the large Sugar Island, positioned in the northwest area of the lake, which hosts several homes. Upper Nemahbin Lake (north of I-94) is a 277 acre lake located in Waukesha County. It has a maximum depth of 60 feet. Visitors have access to the lake from public boat landings. Fish include Panfish, Largemouth Bass, Smallmouth Bass, Northern Pike and Walleye. The lake’s water clarity is very clear. The Lower Nemahbin has slow no wake times between 12pm and 3pm all Sundays and legal holidays. The lakes are fed by the Bark River in Summit. The bark river outlets from the south end of Upper Nemahbin lake to Lower Nemahbin. You can navigate the river from the Upper Lake to the Lower Lake and on to the Lower Nashotah lake. You can see these lakes as the highway (I-94) passes over the channel between the two lakes. Panga Bar and Grill is located on Upper Nemahbin and is a great place for lakeside dining and rentals. Check them out in our date guide. Stolley’s Hog Alley is located on the lake as well. 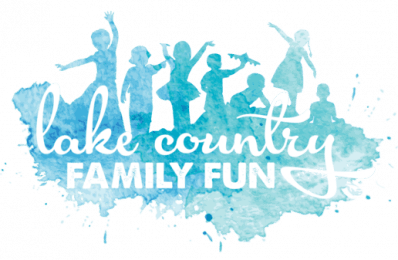 Stolley’s won 2nd place in Lake Country Family Fun’s Best Fish Fry 2018! 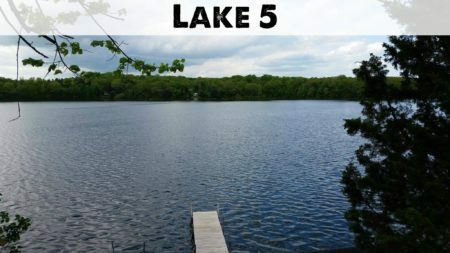 Silver Lake is located in Summit, WI (just next to Oconomowoc) and is 217 acres with a max depth of 40 feet. There is a public boat launch on Valley Road (Hwy B). The lake draws water from surrounding creeks and lowlands. Enjoy dining at the Lakeside Supper Club right on Valley Road with great patio views of the lake. Ottawa Lake is a 17 acre lake that only has a max depth of 16 feet. The lake is very clear, but has weeds. There is access via a public boat launch. See map of lake area here. There is a public beach, read more about the beach in our Beach Guide. Read our Beach Guide here. It is located in the State Park, so state park fees per carload apply ($8 a day for $28 a year). This State Park is a very popular year-round camp ground. Make your reservations early! 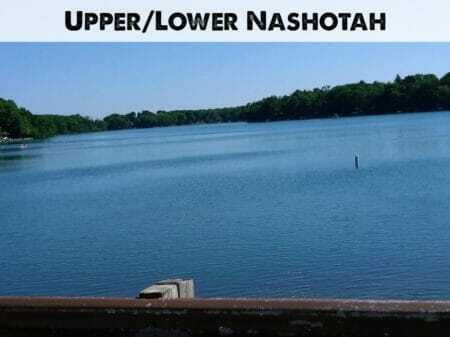 Upper and Lower Nashotah Lakes are part of the beautiful Chain of Lakes that stretch approximately 3 miles from the northern tip of Upper Nashotah Lake to the southern tip of Lower Nemahbin, all connected by a navigable channel. Lower Nashotah Lake is a 93 acre lake located in Waukesha County. It has a maximum depth of 43 feet. Visitors have access to the lake from a public boat landing. The lake’s water clarity is very clear. Upper Nashotah Lake is a 131 acre lake located in Waukesha County. It has a maximum depth of 53 feet. The lake’s water clarity is very clear. The lake features only 2.5 miles of shoreline, most of it owned by a world renown medical facility. No public boat launch. Lake Keesus is a 235 acre lake located in Waukesha County specifically in the town of Merton. It has a maximum depth of 42 feet. Visitors have access to the lake from a public boat landing on the east side of the lake. More details, including launch fees, here. Lake Keesus has approximately 5.3 miles of shoreline and 216 houses. It is made up of 5 bays – Bull’s Bay, Marquardt’s Bay, Marshall Bay, North Bay, and Rice’s Bay. Camp Whitcomb/Mason is located on 306 acres of beautiful land along Lake Keesus in Waukesha County. Find this camp in our Summer Camp Guide. The lake’s water is moderately clear. For those who crave a good visual of the lakes we’ve covered in our Lakes of Lake Country guide, refer to the click-able google map below. Find a lake near me. Above, we have covered 24 lakes! Hopefully you know more about the awesome lakes of Lake Country now than you did before. If you have any helpful information to add, comment below. We will continue to update this guide with more lakes. Stay tuned! We love the Lakes of Lake Country! Don’t forget to #lovelcff this summer when you are out on a Lake Country lake! And be sure to make sure your IG profile is public so we can find you! We can’t wait to see your photos and pick a winner at Labor Day! What lake do you want us to cover next? Comment below! Find us on IG here. Need some further summer fun inspiration, start here! « Amazing Things to Do When in Chicago	» SummerFest is upon us!